Late 1800s Charles Dare track machine jumper with cheerful expression, flowing mane cascading to the shoulder, saddle with volute cantle and leaf and branch motif, bordered and fringed saddle blanket, saddle flap having painted floral decoration, scalloped breast band and breeching. Glass eyes and natural horsehair tail. Older restoration showing some seams. 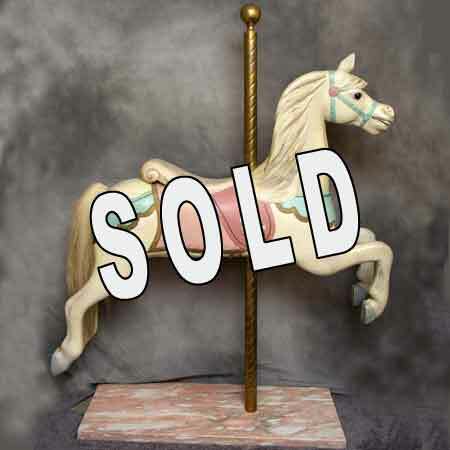 This charming exemplar of the Country Fair style includes heavy marble display stand with brass pole and finial. ~50 long x ~50 high.